In this series of 10 classes you'll learn the most important skills for helping your clients gain their confidence and for expertly using this essential tool yourself in your own practice. Classes are one hour each and take place at The Little Family Room next door to Milagros Boutique in Northeast Portland, one weekday evening each month (no classes in June or July). We begin each class with a 5-10 minutes of networking and connection, then focus on absorbing information and practicing for the rest of the hour. All carriers and weighted dolls for hands-on experience during class are provided for no additional fee. Light snacks will be provided, sometimes even a pizza! Classes take place from 7:00-8:00pm and are taught by Amy Rainbow and Marcie Berzinskas of Adjoyn. Classes may be purchased for $20 each. Save 25% by purchasing the whole year of 10 classes in advance for $150. Online versions are also available for $40 per class. To encourage community interaction, in-person classes are more affordable. A mix of "half 'n half" is also available: 5 in-person classes and 5 online classes, of your choosing, for $25/class. *More savings! Agree to volunteer your new skills to at least 3 Portland Area Babywearing meetings and get another $20 off the bundle of in-person classes. Need something customized for your small group? All classes can also be delivered as private sessions in person or as online sessions, or schedule a private group session. We are also available to speak at conferences, play groups, support groups, and other events. Contact Adjoyn to start arranging something special today! Why choose Adjoyn for your workshop? Evidence-based up-to-date information from a Certified Babywearing Consultant, Amy Rainbow and Marcie Berzinskas. Marcie has served as both a local and national board member for Babywearing International, and continues to volunteer for Portland Area Babywearing and serve her community through professional babywearing consultations and classes. We understand life happens! In the event you cannot make it to class, we have a refund policy. 100% of your class fee shall be returned if you're giving birth yourself or attending the birth of your child. ​50% refund and 50% credit to another class if you're attending a birth. 100% credit to another class for all other reasons. Past Events -- We had a great class in January! 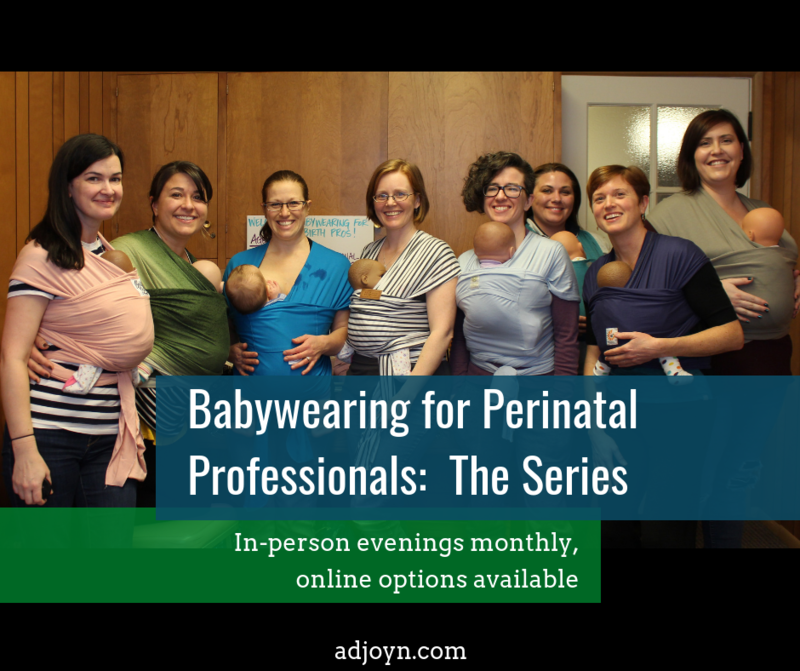 That's me on the far left with 7 postpartum professionals learning all about babywearing! Students included doulas, retail professionals, and a chiropractor. Thanks for attending! !